Disclosure: This post contains an affiliate link, which means we may receive a commission if you click a link and book this accommodation from our site. While clicking this link won’t cost you any extra money, they will help us keep this site up and running! Thank you for your support! 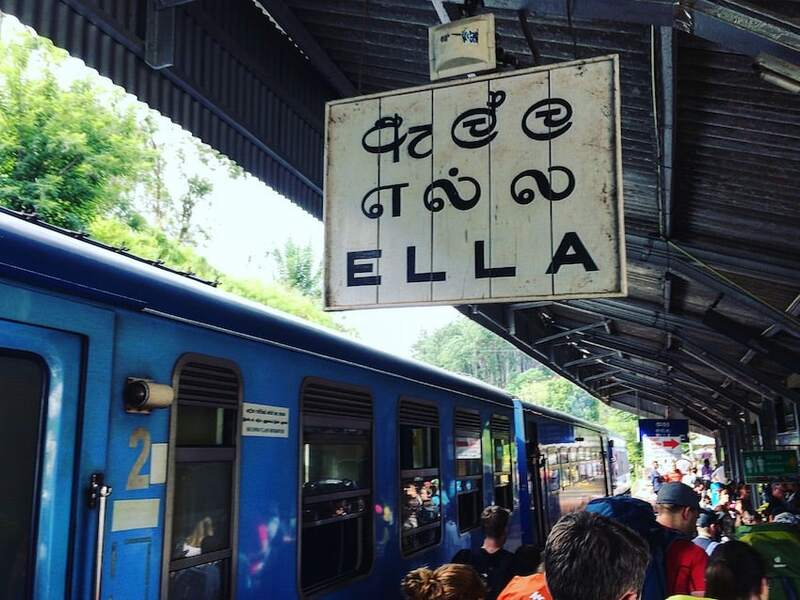 When backpacking Sri Lanka, be sure to include Ella into your itinerary. Set in the heart of Sri Lanka’s high hill country, Ella is the perfect base to spend a few days exploring tea plantations, hiking the hills and, with it’s cooler, misty climes, is a fabulous escape from Sri Lanka’s incessant heat. There are loads of things to do in Ella with kids. For a start, just getting to Ella is definitely a highlight and a tourist attraction in itself. Catch the long, very slow but marvelously blue, train from Kandy. It’s rumoured to be one of the most beautiful train journeys in the world – and it’s easy to understand why. Check this post to get top tips on securing tickets on the Kandy to Ella train. Surrounded by rolling verdant hills, textured by hundreds of tea plantations and lush forest, Ella is firmly on the tourist trail, which means an easy stay for families backpacking Sri Lanka, with a plenitude of good accommodation, excellent food options and a wonderful chilled out vibe. We loved that most things to do in Ella are free! After shelling out hefty entrance fees for some of Sri Lanka’s iconic sites, temples and safaris, Ella will be a welcome relief for your trip budget. We threw that extra into our bed budget, indulging ourselves at the fabulous Zion View. Here’s our guide of things to do in Ella Sri Lanka with kids. Out of all the things to do in Ella, my favourite was our visit to the Nine Arch Bridge. I’d seen this iconic bridge adorning many an instagram feed, so I was keen to see it with my own eyes. Standing 33 feet high, it’s set in a stunning setting of rural Sri Lanka amid emerald tropical forest. With kids, something so simple as walking the railway tracks in Sri Lanka (unthinkable in the UK) turns into an adventure. Walking the tracks over the nine arch bridge and through the tunnel was one of my favourite things to do in Ella. Full of bats, the black tunnel is particularly fun for kids. It’s short enough to be scary but safe, and the welcoming light at the end of the tunnel guide you easily through. The high pitched screetches and flapping wings of the bats mesmorised our girls. If you’re lucky, like us, at the other end a 10 year old girl, wielding a machete, will hack open a coconut for you to quench your thirst for 100 rupees. Be sure to know the train times. We made it out of the tunnel to a flustered french family anxiously babbling at us that a train was arriving imminently. In fact it was 12 whole minutes later. Don’t worry there’s enough space on the bridge for the train and yourself without it being dangerous. The tunnel is slightly more precarious on space. Don’t worry about the guards, they were so lackadaisical and didn’t bat an eyelid at our sauntering through the tunnel. No baksheesh needed either. One thing I wished I’d done was to check the train times ahead of schedule. Not particularly for safety reasons -for photography ones. The 9 arch bridge is of the most spectacular photo destinations in Sri Lanka. Uva Halpewaththa tea plantation is a great morning visit. Find out about the fascinating process of this famous leaf. 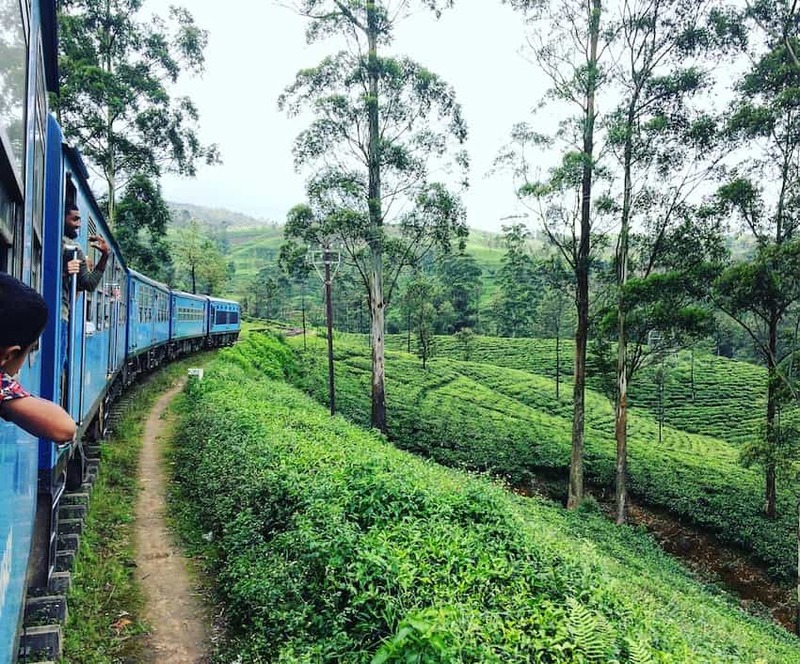 During the hypnotic rocking and rolling train journey from Kandy to Ella, your eyes will have feasted on a million upon millions of rows of tea bushes, planted high and low, stretching as far as the eye can see. Sri Lanka is famous for it’s tea and is the 4th largest tea producer in the world. 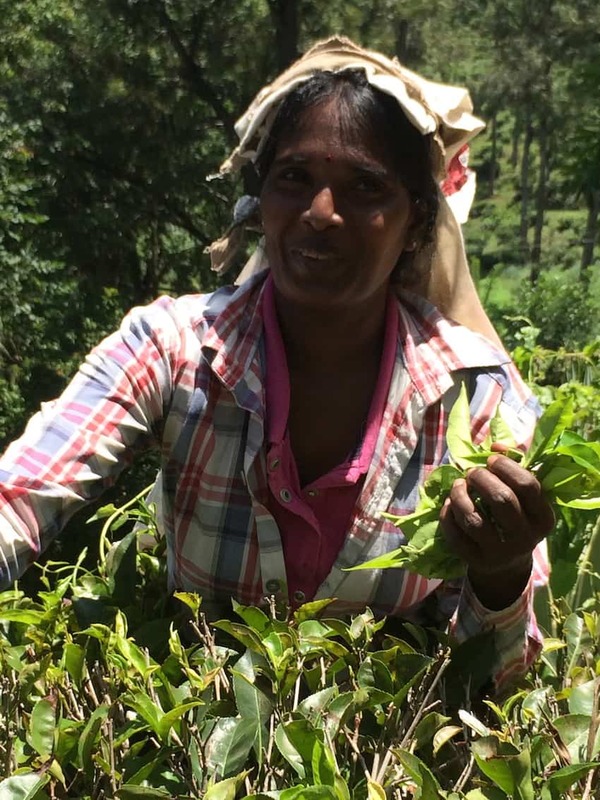 Ella is one of 6 regions in Sri Lanka that grow this infamous plant so firmly entrenched in our English roots, and is one of the best areas for tea trails in Sri Lanka. Another of the best things to do in Ella Sri Lanka is to visit a tea plantation. In fact, to leave Sri Lanka without a visit to a tea plantation, would be frankly unthinkable. A Sri Lankan tea tour is a great way to teach kids the from farm to fork theory or rather from plantation to tea cup. We visited the Uva Halpewaththa tea plantation, who give fantastic informative morning tours that taught us a whole lot about the business of tea. After a quick classroom session on the plant, the tea regions, how it came to Sri Lanka and the different stages of production, we then walked the hugely interesting production line which vibrated, rolled and pounded the tea from one end of the tea factory to the other. At the end we were treated to a spot of tea tasting the best Ceylon tea. How civilised! Uva Halpewaththa tea factory does not produce on Sun and Mon so don’t visit on these days. It takes less than 15 minutes from Ella in a tuk tuk (1200 rupees there, 1-1.5 hours waiting and return). Note: There are no tea pickers at the Uva Halpewaththa plantation as it’s only a processing plant. We made the choice to visit this plantation as it was highly recommended as the best in the area. If you’re after the must have tea picker photo, you will have to look elsewhere. The photo of the wonderful tea picker above taken above was whilst walking through the tea plantation on the beginning of Little Adam’s Peak hike (see below). One of the best things to do in Ella Sri Lanka is HIKING! 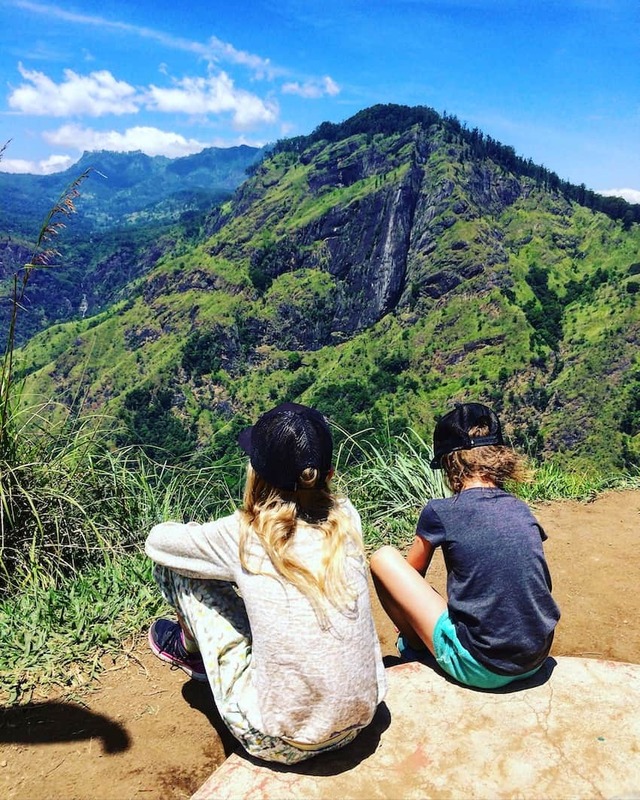 If you’ve got older, hardier, hiking kids then definitely consider climbing Ella’s Rock or Adam’s Peak, two great mountains taking 4 hours and 6 hours respectively. It took us around 30 minutes to climb up to the top of Little Adam’s Peak, negotiating the 312 steps. I was actually expecting it to be much harder! We were rewarded with stunning views over to Ella’s Gap as well as a rather lovely orange clad Buddha. Young families will manage Little Adam’s Peak with no bother. Set off ideally early morning to avoid the midday heat, and if you set off as early at 7am you’ll be rewarded by seeing the plantation workers walking to work. One of the best things to do in Ella Sri Lanka is to catch the train to Kandy or vice versa. It’s a long 7 hour journey but one of the best train journeys in the world! If Ella is on your radar, no buts – take the train. 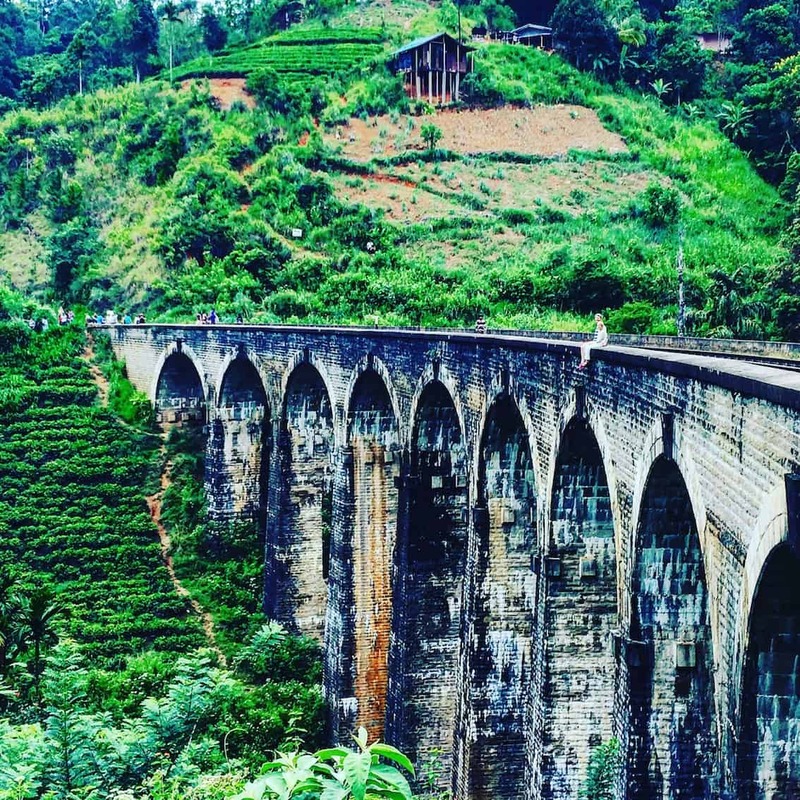 This stretch of track from Kandy to Ella is said to be one of the most beautiful train journeys in the world. Climbing altitude, curling through misty hills and past stunning tea plantations, sit back and relax, watching rural life unfold before you. Pre-book tickets early to get a reserved 2nd class seat which will bag you a quiet carriage where you can hang out of the door to your hearts content. Otherwise our massive top tip, particularly with pressure to get seats for kids for the long 6 hour journey, is to get on the station before Kandy, at Peradeniya, which is where the Botanical Gardens is (which is included in our Things to Do in Kandy post, read it here). We slipped quietly into seats vacated by the Colombo crowd as the train eased into Kandy. We didn’t envy watching some travellers stand the whole 6 hour journey. 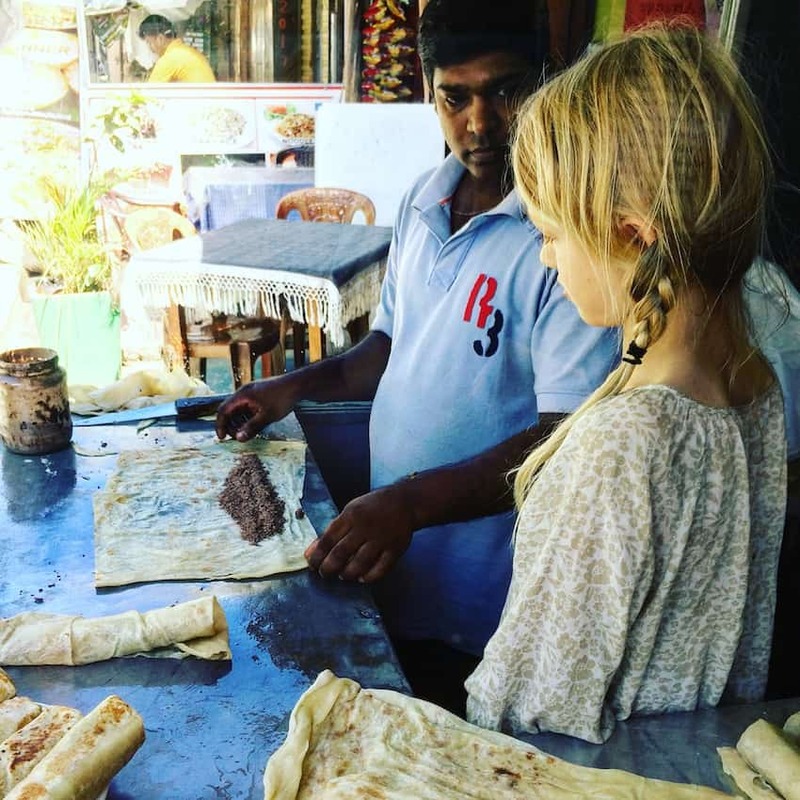 If your kids have been struggling a bit with the local cuisine, put a smile on their faces by treating them to a seriously tasty chocolate roti. At the end of the main strip N2 restaurant is a low key local joint owned by the friendliest of guys. Grab one of their chocolate rotis (a roti is a delicious flat bread. They grate chocolate into it and roll it up) for 300 rupees. Stay in beautiful beach side open air tree top cabanas! They are seriously good and guaranteed to have your kids begging you for one every day. No joke, once we discovered this gem of a roti takeout we made a stop there once a day and even stocked up for our Little Adam’s Peak hike for a welcome bite at the top. The guys will even let you into the roti pen for your own masterclass if you ask. The Chill Café in Ella is an amazing place to relax, play some backgammon, listen to chilled tunes and grab some fantastic food. These guys have got it dialled! 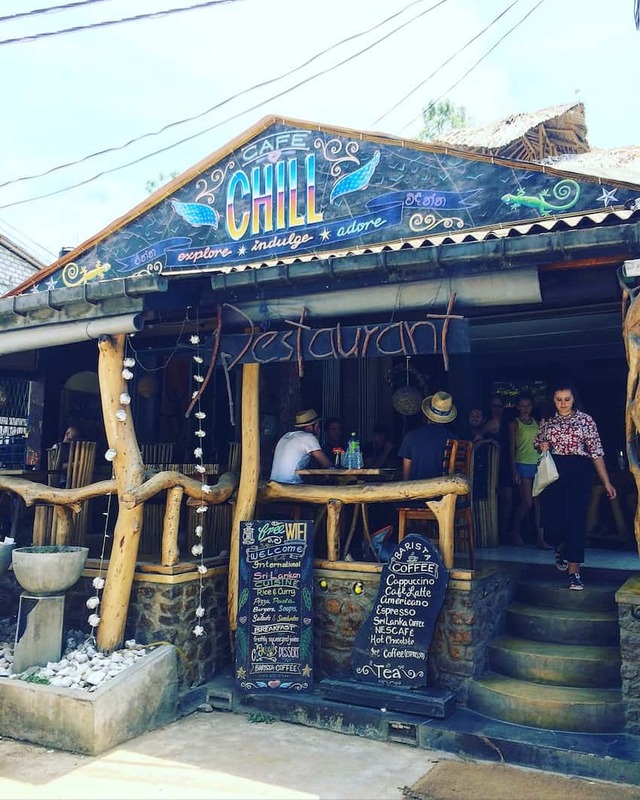 The Chill Café in Ella is a real travellers hang out. The first we’d seen in Sri Lanka. These guys have seriously got it down. It might not seem much from outside but make your way into the back and head upstairs. Here you’ll climb up to the tree house for some shoes off, laid back vibes. The food here is delicious – even the Western fare. So it’s a great place for your kids to get their fix of Western food before moving on. It’s easy to kick back here and while away an afternoon or two. Don’t leave without trying the Lambrais – meat and Sri Lankan vegetables slowly cooked in a banana leaf – pure heaven! A lot of people rave about Ravana Waterfall. For us it was a complete let down. Maybe it’s because it was billed as a swim hole and the reality was a main road loaded with tourists over the bridge, all in view of the small pool. I don’t want to swim with a watching crowd thanks. Plus a battered sign casually told us swimming here was illegal and 36 people had died doing it. No thanks. Have you been to Ella Sri Lanka with kids? What were your highlights? Tour du Mont Blanc Difficulty – Can You Manage the Ladders?